Molecular gastronomy, Sous-vide and fire-roasted menus are just three of the cutting edge modern culinary techniques Aaron’s Catering has introduced into our catering repertoire for our clients. Molecular gastronomy combines a knowledge of chemistry, physics and ingredients to transform the taste and texture of food. We invested in all the equipment and tools to experiment with geometric food shapes and taste under different temperatures and pressures with this cooking style. Our chefs have successfully applied this new technology to create such phenomena as smoking cocktails, faux caviar of olive oil for hors d’oeuvres, and transparent fruit spheres with intense citric flavor. This gastronomic art and science adds a sophisticated touch to reception and dinner menus. Although the Sous-vide theory of cooking was developed over 150 years ago, the method has been recently re-discovered and applied to certain foods when it is desirable to retain juiciness, aroma, texture and avoid over-cooking at higher temperatures. Today, top chefs around the world have been trained in this method including Aaron’s Catering. 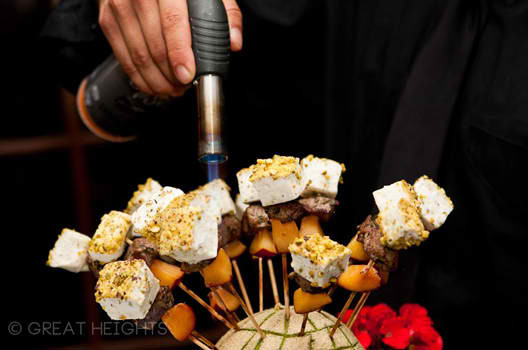 Foods cook evenly and thoroughly, a key factor in insuring quality when serving 500 guests on time! Fire-roasted technique is an extreme culinary sport—don’t try this at home!!! The Florida weather is perfect for cooking food on site over a fire so that you and your guests taste the freshest foods imaginable. The experience of standing near a fire smelling the foods as they slowly roast to perfection is something you and your guests will never forget. We use a variety of techniques for our open-air roasting: a long raised grill for classic burgers, dogs, and portabellas; a fiery torch and wrought iron stand to flame roast hanging quarters of beef, lamb, pork and duck; and a wire grate over a wood burning pit for a traditional South American Asado of chicken, ribs, corn, potatoes and vegetables. Chefs and guests love to connect together to see and smell the food as its being created. All the menus complement the central fire-roasted entrees. Typically served with these fabulous smoky entrées are such accompaniments as gazpacho, grilled flatbreads, Chimichurri and other sauces, dips, chutneys, artisanal cheeses, trout pates, mussels in a cauldron, charred corn-on-the-cob, carrots, mushrooms, asparagus and other veggies. Field green salads provide a cool crisp balance. Desserts range from berry cobblers and fresh fruit salad to apple crisp.